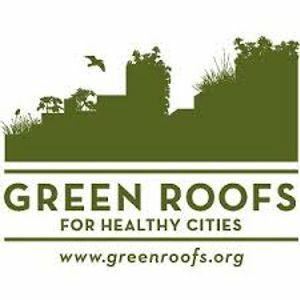 Brought to you by Green Roofs for Healthy Cities, the 6th Annual Grey to Green Conference is taking place on May 15-16, 2018 at the Chestnut Conference Centre in Toronto. Grey to Green focuses on green infrastructure design, research and policy and connects professionals working to integrate natural elements into the built environment. The 2018 agenda features a wide variety of innovative content on stormwater management, urban agriculture, biophilic design, green infrastructure and the Internet of Things, and designing green communities. Grey to Green commences with a FREE public forum on May 15th at Toronto Metro Hall to discuss Designing Future Cities with Green Infrastructure. Steven Peck, the Founder and President of Green Roofs for Healthy Cities, will kick off the night with an industry update and speak to the ever increasing need to adopt green infrastructure in our cities before introducing the events panelists. Architect Tye Farrow, a senior partner at Farrow Partners, envisions transforming the Bloor Viaduct into a “Living Bridge” complete with individual housing suites, restaurants, hotels as well as pedestrian and bike paths. Claire Nelischer from the Ryerson University City Building Institute shares her research findings on the need for the Rail Deck Park, a proposed 21-acre park in downtown Toronto that would be built overtop of the rail corridor between Blue Jays Way and Bathurst Street. As designers and researchers continue to intrigue the region with futuristic projects, Grey to Green also highlights the importance of green infrastructure policy to the success and continued growth of the industry. Deborah Martin-Downs, the CAO of Credit Valley Conservation and Chair of the Green Infrastructure Ontario Coalition, will discuss new policy developments that facilitate green infrastructure investment in Ontario. 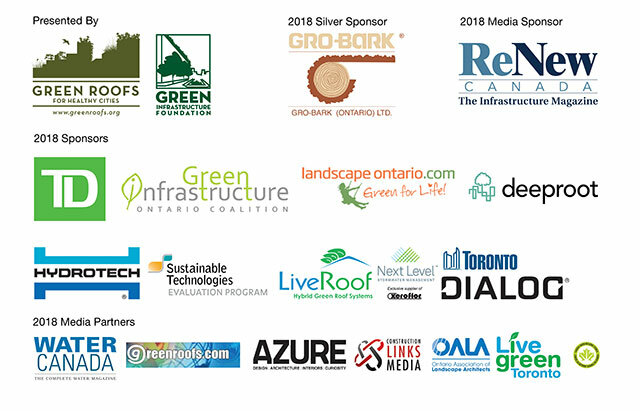 The bulk of Grey to Green will take place on Wednesday May 16th showcasing a lineup of speakers that are leading the way for green infrastructure adoption and widespread implementation. These thought leaders and change agents will give you exclusive access into their design processes, research findings and policy developments that will no doubt be part of our future urban fabric. Don’t miss the Afternoon Keynote featuring Craig Applegath, Founding Principal of DIALOG’s Toronto Studio who will present Addressing Climate Change through Green Infrastructure and Paul Kephart, Principal, Ecologist and Designer at Rana Creek Design, as he talks about San Francisco’s Transbay Terminal Center Rooftop Park as well as discussing the work on the JNBY Headquarters Rooftop Tea Production in Hangzhou, China. The concurrent sessions explore trends in urban agriculture, green walls, rain gardens, green roof research findings, biophilic design and stormwater management all under the theme of building resilient communities. Save $100 on registration when you sign up before March 29, 2018! Grey to Green will also feature a variety of training courses on May 15th such as Biophilic Design, Introduction to Rooftop Urban Agriculture, Green Roof Design & Installation and Green Walls 101. To top off the event we have also curated an array of tours to highlight Toronto’s outstanding green infrastructure projects. Explore Toronto’s East End that has been reinvigorated with green infrastructure design, get your boots dirty with a bus tour of the Gro-Bark mulch production plant and tour the Ryerson Rooftop Farm! Register for tours and training courses at greytogreenconference.org. Grey to Green Conference is pending approval for up to 7.5 Continuing Education / Professional Development Hours by LA CES, AIA CES, BOMI, APLD and RCI. Can’t make Grey to Green 2018? CitiesAlive 2018 is currently accepting proposals until March 11, 2018. Visit citiesalive.org for details. GRHC’s mission is to increase the awareness of the economic, social and environmental benefits of green roofs and green walls, and other forms of living architecture through education, advocacy, professional development and celebrations of excellence. Visit www.greenroofs.org for more information. Contact Steven Peck, GRHC founder and president at [email protected] and 416-971-4494 x 233.